SLIM Companion Explorer mimics Windows Explorer in a browser. It is easy-to-use, easy to deploy, cost-effective and fast. 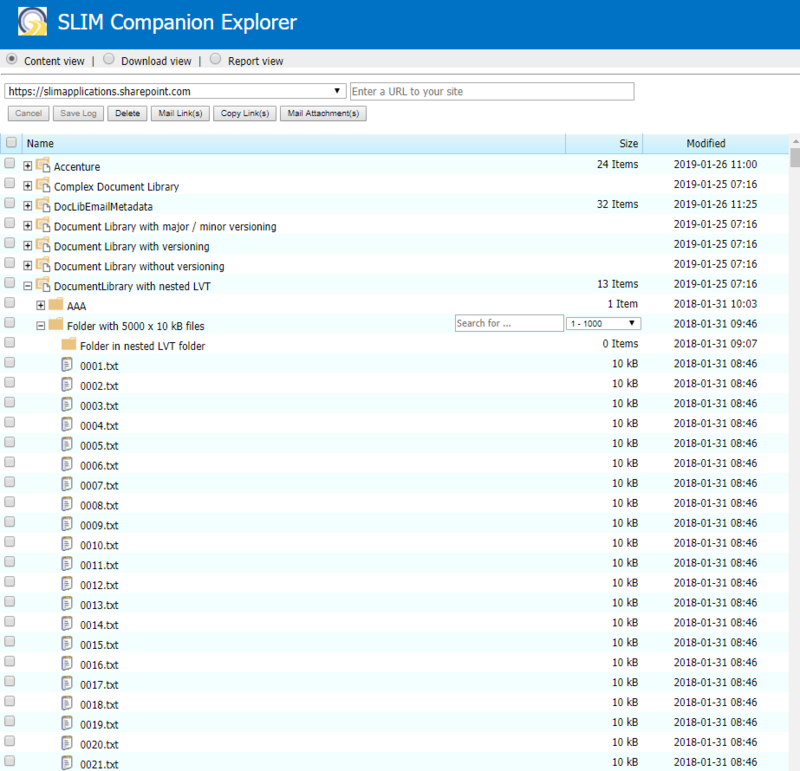 Note: SLIM Companion Migration Manager has been rebranded as SLIM Companion Explorer to better reflect it’s capabilities. Upload complete folder structures from the user’s computer, file shares, OneDrive, Google Drive, Dropbox, Box and SharePoint 2007/2010/2013/2016/Office 365 by using drag and drop. Extract properties from source files (e.g. modification date) or document properties (e.g. GPS coordinates in a jpg file, subject in an msg file, or keywords in a pdf file) and capture them into SharePoint columns. Preview files, delete items, move files or download items just as with “View in File Explorer” or “Open with Explorer”. The tool is compatible with SharePoint Online (Office 365 incl. Office 365 Groups and Microsoft Teams), OneDrive for Business, SharePoint 2013 and SharePoint 2016. Slim companion tool helped my migration work of 100+gb local data to Sharepoint online. the most beautiful thing about the tool is its super fast & efficient ! just loved it, I would recommend this for bulk uploaders. Simply drag and drop content from your source (e.g. file share) into the Explorer tree. Use the default Content Types (e.g. "Document" or "Folder") or select custom Content Types, set metadata (optional) and start the upload. View the migration log and check for warnings. SLIM Companion Explorer transforms your browser into a powerful migration tool supporting large data volumes, multiple sources, very large files and custom metadata. This innovative tool is easy-to-use, easy to deploy, cost effective and fast. Last and not least, the tool is highly scalable because it can be used by multiple users at the same time. SLIM Companion Explorer transforms your browser into a powerful tool for SharePoint. It enables users to upload content from a variety of sources (e.g. file shares, SharePoint 2013, …) using drag and drop. It supports custom metadata and Content Types, extracts properties from popular file formats (msg, pdf, jpg, docx, …), supports large document volumes and is fast. The tool does not require any software installs on SharePoint or the user’s computer. 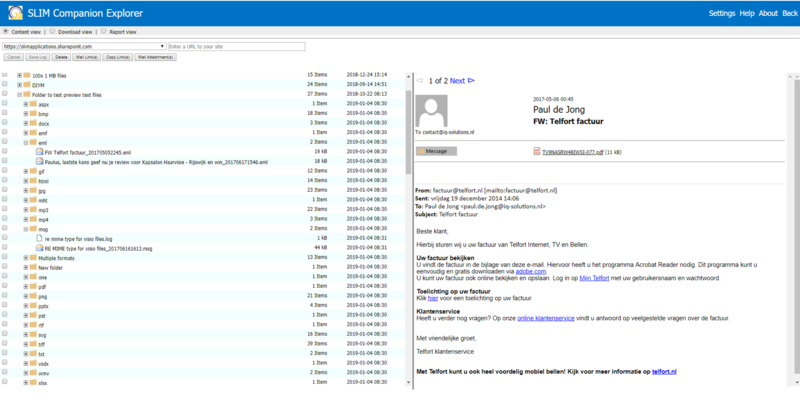 The tool consists of a few small files (total size 1.5 MB) that need to be uploaded to SharePoint. Access to the tool can be easily restricted by using standard SharePoint permissions. – low maximum file size. Migrating content to SharePoint is simple. Open the source (e.g. file share) in Windows Explorer and drag the content into the required location in the SLIM Companion Explorer tree. Note that only Chrome, Opera, Firefox, Edge and Safari support dragging folders. Explorer first creates an inventory of the selected content. By default all content is marked for uploading. You can exclude folders (and it’s contents) by unselecting the checkbox(es). By default documents and folders are uploaded using the “Document” Content Type and the “Folder” Content Type respectively. Explorer allows the user to select different Content Types and also to set values for metadata fields used in these custom Content Types. Properties in source files (e.g. keywords in PDF files, GPS coordinates in jpg files, ..) can also be mapped to columns in the custom Content Types. Explorer supports commonly used metadata types like single line of text, choice, dates, … but also managed metadata. Upon clicking “Proceed” a check is done if there are required fields in the Content Types that do not have a value. If so, they are marked in red and the user is informed to provide a default value. If the checks are all successful the uploading starts. The progress for each item is shown. Item names are greyed out when they have been uploaded successfully. When all items have been uploaded the upload statistics table is shown. The migration log provides filters to only list items meeting a specific criteria (e.g. failed). The list with uploaded items can also be downloaded as a csv file. Some organisations want to stop using folders and only use metadata to organise content. Explorer allows uploading of documents in nested folders structures without recreating the original folder structure. The original path details can be captured into SharePoint columns for use in views. The tool also ensures document names are made unique to avoid overwriting documents with the same name. To skip folders select the option “Skip folders and flatten folder structure” for folders in the metadata popup window. SharePoint imposes restrictions on the characters used in item names, document sizes, document types, uploading items with too long names, long URLs, etc… Explorer automatically caters for this. 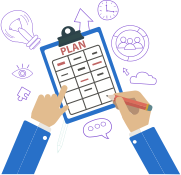 The tool detects the SharePoint (or OneDrive for Business) version and applies the appropriate fixes for that specific version. For example, SharePoint 2013 blocks several file name extensions (e.g. exe and bat). A blocked file is automatically placed into a zip file during uploading to ensure the file can be uploaded to SharePoint and remains part of the uploaded content. The mapping between document properties and SharePoint columns is managed centrally but individual users can update their personal mappings (under the “Settings” menu). Attachments in an email preview can be directly opened without downloading the email. This increases productivity for users and enables users to open msg emails (and their attachments) when they do not have Outlook installed (e.g. macOS users or users with a tablet). The contents of zip files is shown by clicking the expand icon. This shows the zip file’s contents without downloading the entire file. Individual files in the zip file can be directly opened / previewed. Documents stored in SharePoint often need to be shared with others through email. This typically involves downloading a document, opening a new email and attaching the document. The steps become progressively more cumbersome when dealing with multiple documents. Explorer simplifies this. Select one or more documents and click the button “Mail Attachment(s)”. This generates a new email message with the selected documents attached. These properties can be mapped to a SharePoint column to keep the original value. For instance this allows content migrations of legacy content without creating content with a new modification date. Keeping items with the original modification date is very valuable for viewing and sorting content. It may also help identify content which is no longer required. Explorer supports migration of large document volumes (10’s of GB’s). Larger data sets can be easily split into smaller parts by excluding folders. The maximum file size supported is 15 GB on SharePoint Online, 10 GB for SharePoint 2016. For SharePoint 2013 the maximum file sizes are browser dependent (see release notes at the bottom of the page). Unlike many migration tools there is no limit in terms of the data volume uploaded or downloaded. The tool allows users to create a basic inventory of the content of a SharePoint document library, picture library of asset library. For example, list the number of documents, the number of folders, content types used, number of major versions, diskspace consumed by document versions, … The inventory of documents and folders can be exported as a CSV file. Major and minor document versions can be deleted in a controlled way. For example, delete all major document versions apart from the 3 most recent versions. Explorer also allows a user to create an inventory report of source system (e.g file share) which can be downloaded as csv file. Recently the standard SharePoint modern view has been extended to allow downloading of folders. This functionality is not available when using the classic view or SharePoint 2013. Explorer allows downloading of multiple documents and/or folders into a zip file. Very large document volumes are supported (e.g. 10’s of GB’s) by using multiple zip files. The 5000-item List View Threshold prevents access to content unless special measures (e.g. views using indexed columns) are used. Explorer caters for Document (and Picture and Asset) libraries that exceed this limit. The content is retrieved in chunks and does not require any changes to SharePoint. Using Explorer it is possible to browse through large lists, Download & Zip it’s contents and report on the list’s content. Explorer supports migrations to SharePoint 2013, SharePoint 2016, OneDrive for Business and SharePoint Online (Office 365, including Office groups and Microsoft Teams). The tool can be used with Document Libraries, Picture Libraries and Asset Libraries. The latest versions of Chrome, Opera, Firefox, Edge, Safari plus Internet Explorer 11 are supported (on Windows clients and Mac OS). Note: uploading folders is not supported on Internet Explorer 11. The supported sources are the user’s computer, file shares, OneDrive, Google Drive, Dropbox, Box and SharePoint 2007/2010/2013/2016/Office 365 and OneDrive for Business. Note: the source system needs to be accessible through Windows Explorer or Finder. Or contact us directly (here). To summarize, SLIM Companion Explorer transforms your browser into a powerful tool to improve productivity, increase adoption and simplify migrations. This tool saved my life moving 750GB of local data to my customer’s Sharepoint environment. Good overview of uploaded files & folders and very fast tool to work with. Manual uploading should take several days, regarding the Sharepoint upload status bar.